Gloria Boileau is an internationally renowned speaker, motivator, a member of the National Speakers Association, former jury consultant and an expert on fear. Recognizing that fear can be as beneficial as it is restrictive, Gloria has sought out to teach people to identify, distance themselves from, and eventually relate to their fears in a constructive manner. Gloria became acutely aware of the over-abundance of escalating fear in our daily lives: fear of failure or success; fear of committing to a relationship; fear of surviving these uncertain economic times. Moreover, she was astonished by the amount of artificially propagated fear. Our politicians campaign on threats of terrorism and financial destitution; pharmaceutical companies pressure us to buy products to alleviate and help illnesses; restructuring Social Security may leave millions of elderly people homeless; churches promise eternal suffering to non-believers; teachers manage their classrooms with the fear of grades; coaches bully their athletes with demeaning comments; bosses manipulate their employees with the promise of promotions and raises. Our society has become so dependent upon fear that it has permeated itself into nearly every aspect of our lives. The moment we buy a magazine or newspaper, listen to a radio or television show, or participate in a conversation that is founded in fear, we become active participants in the problem. As a society we must learn to relate to the fear rather than react to it. 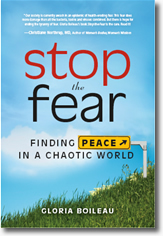 By becoming a part of the solution and applying techniques found in Stop the Fear we can stop today’s fear from impinging on us any further as individuals and as a society so that we can create a more enriched and complete life. As we learn to conquer our fear, we can dramatically change our life and our world for the better. Gloria Boileau is available for interviews or discussions about how we can stop the misuse of fear and become a more responsible and secure society.